I presented a webcast for BrightTalk to put on record a view that few people had considered, that is, the political dimensions of cloud computing. The political stakes were raised exponentially following the disclosures of Edward Snowden and dubbed PRISM. You have to be registered to access BrightTalk and you can do that when you click here. While security has ensnared the cloud landscape, and technology may help iron out some of the misgivings there is a bigger conversation at hand: the politics of cloud. 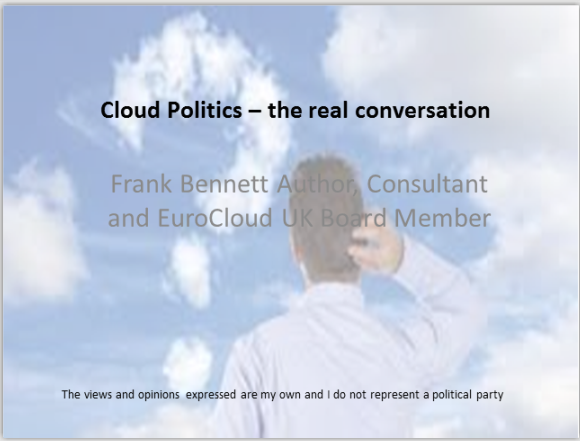 Security may have dominated but the politics of the cloud are more powerful, and their murky world is less understood.